Vole O'Speed: To gyrate, or not to gyrate? To gyrate, or not to gyrate? There seem to be no hard and fast rules as to when a roundabout becomes a "gyratory system", or a "gyratory system" becomes a "one way system"; it seems to be a matter of opinion, but I think we all know what a gyratory is. It is a big system of traffic that circulates in one direction, often so big that there are many buildings in the middle. It is also fair to say that gyratory systems are widely hated by cycling and pedestrian campaigners and assorted other environmentalists and urbanists: associated, in their UK application, as they usually are, with heavy traffic flows, speeding motor vehicles, inconvenient pedestrian crossing arrangements, hellish cycling conditions – where cyclists have been effectively just "thrown to the lions" and told to fend for themselves, with no facilities – pollution, noise, decay, alienation, an un-human, bad-scale environment, and general awfulness. But then again, we may wander, or sedately pedal, around some of the environmentally best-organised cities in Europe; what about Amsterdam, Utrecht, Copenhagen, Bruges, Münster? We find them to be largely free of this nastiness: clean, easy to traverse, quiet and sociable. But look! Actually, so many of the streets we are traversing are one-way for motor vehicles (two way, of course, for bikes, and often also for buses and trams). And, examined on a larger scale, we will see that these streets are often organised as gyratory systems. So what's happening here? Are gyratories intrinsically bad, or is it just their normal UK application? This subject has been covered in a very good blog post from last year by As Easy As Riding A Bike, with plenty of pictures of examples from the UK and the Netherlands. I recommend study of this, and I won't repeat what he says, but I'll try to relate it here to some current discussions over gyratory systems in London. The general point is that gyratory systems are just tools of planning which may be used to create very different types of environment, depending on what the intention is. If the planner is determined to force a maximal volume of traffic through a junction, or district of streets in a city grid, they can use an appropriately-designed gyratory system to accomplish this. If they wish to prevent motor traffic from using streets as through-routes, or if they wish to reduce motor traffic in an area of a city to an essential minimum, or if they wish to make space for wider pavements, segregated cycle tracks, or bus lanes, or do a combination of these things, then a system of appropriately-designed one-way streets and gyratory systems is also the way in which to do it. It is the intention behind the planning that matters, not the number of directions of motor travel on any given bit or road. Importantly, one-way and gyratory systems can be designed to give motor vehicles longer, slightly less convenient journeys, and cyclists direct, convenient journeys, and can thus be used to bias travel patterns towards the bike. I came to understand, way back at the end of the last century, that one-way traffic systems are not necessarily evil creations that cycle campaigners should be on principle opposed to. Paul Gannon, when he started campaigning with Camden Cycling Campaign, had returned from living in the Netherlands, where he had noted the constructive use that was made there in introducing one-ways in narrow grid-pattern city streets to create the space for cycle facilities and block through motor traffic from large areas. I described the campaigns of this period before, in this blog post, where I explained that the Seven Stations Link cycle route through Bloomsbury that we planned was predicated on creating new one-way streets to make space for two-way cycle tracks. (This pattern was common in the Netherlands in this period, though it has become less common since, as such streets tend to have been closed entirely to through motor traffic in more recent schemes). 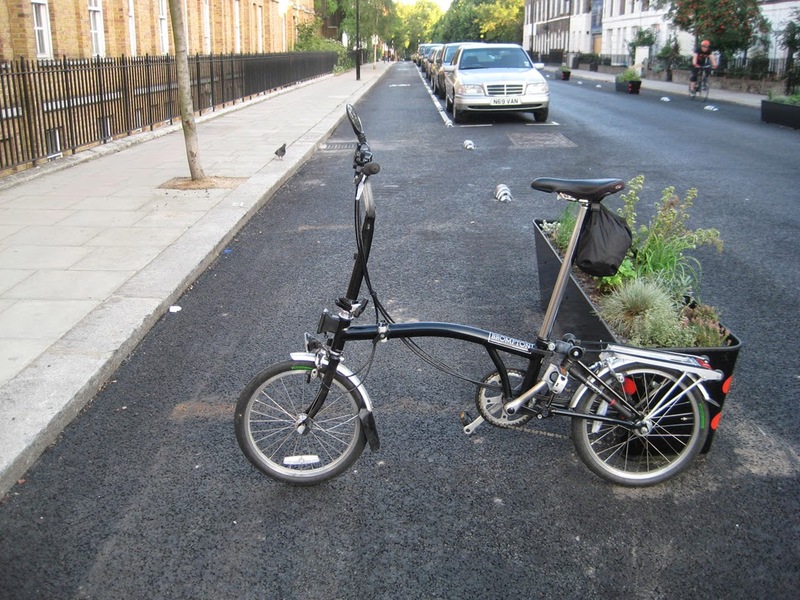 The reason the Bloomsbury cycle tracks are so narrow and compromised now was that Camden Council did not do what we wanted, but attempted to fit two-way tracks into the space that should have been used for a single direction. The tracks were planned to be twice as wide, but lobbying by the black cab drivers, who wanted to preserve their two-way back-street rat-run between Euston and Kings Cross, foiled the plan, amid changes at the council which removed the people who might have had the determination to see the proper scheme through. The Seven Stations Link in Bloomsbury: half the width it should have been, because the road was not made one-way for motors. More recently, I observed, and David Hembrow explained, on his excellent study tour of Assen and Groningen, how carefully-worked out one-way systems, with merely signed cycle exception, are the entirely standard, non-intrusive, low-engineering model used in Dutch towns to minimise traffic in small residential streets, which become excellent routes for cycling and walking in consequence. In another type of environment, the one-way system of Camden town, with its many bad features remaining, is at least such that it allowed Camden to progressively reduce the single direction of motor traffic on Royal College Street from three fast lanes to one slow one, which has allowed the construction of the (fairly) successful cycle tracks there, part of the Somers Town route from Camden to Euston Road, give or take a few planters demolished from time to time. 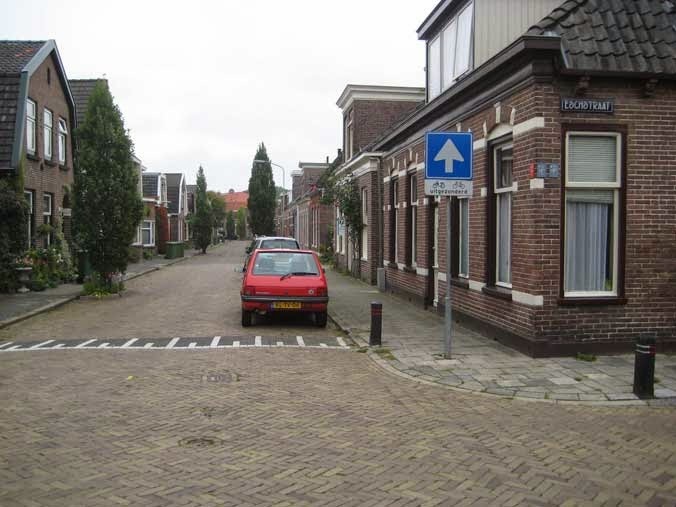 Standard Dutch residential street, where a system of one-ways, with signed cycle exception, minimises through motor traffic while allowing easy access to all properties. Whereas I used to think, at one time, that roundabouts were necessarily anti-cycling, and that they should be all replaced by signalised crossroads, I've come to realise that this was a simplistic idea, and really quite wrong. Lots of signals are the last things we need on the streets, if we wish cycling to be an efficient, pleasurable and competitive mode of transport. The Dutch and Danes show us how roundabouts properly designed for cycling are an excellent replacement for signalised junctions, reducing delays and congestion for both cycle and motor traffic, enhancing safety, reducing pollution (due to idling traffic waiting in queues), and making the cycling experience easy and smooth. Classic (and usually correct) cycle blogger Freewheeler noted, somewhere that I can't find now, that though removal of London's bad gyratory systems and replacement with normal junctions would make conditions a little better for existing cyclists, it was in no way a prescription, or even part of the prescription, for the conditions for mass cycling, Dutch-style, which requires almost total separation of cyclists from heavy flows of motor vehicles (both for the reason of subjective safety, and the because it is the only practical way of making space for really large-scale cycling). We've seen the recent disastrous example of Piccadilly and Haymarket, where the return of these streets to two-way working, heralded by the Mayor as a great public realm project for his Olympic city, has resulted in conditions (on Piccadilly) no better for pedestrians than they were before, a hellish cycling environment, as much congestion as before, if not more, as much pollution, no improvement, so far as I can see, in bus service or convenience, and no improvement, so far as I can see, even in conditions for taxi drivers and other motorists. So I think the subject of what to do about London's anti-cycling, and generally bad, gyratory systems deserves careful consideration, and not dogmatic position-taking. I think there are cases and cases; there are probably cases where the best cycling and walking environment can be most easily got, at minimal expense and reworking, and with minimal opposition, by keeping gyratory systems, for private motor traffic and taxis, as they are, but introducing changes for other road users. There are other cases where the best and easiest solution is the abolition of the gyratory system. I'll raise here two current cases of discussion which I think are examples of both these situations. I last discussed Tottenham Court Road (in what has become, surprisingly, the second most popular post on this blog), in August 2011. I pointed out then that Camden's plan to transform this road (the northbound arm of the one-way system that also includes Gower Street and Bloomsbury Street) was the best opportunity so far presented of usefully extending Camden's still slight segregated cycle network, that had remained unexpanded since the completion of the Camden section of the Seven Stations link around 2002. I criticised the plans produced at that time by the council, which showed a dishonest artists' impression of a future Tottenham Court Road, two-way and reserved for buses and cyclists, in which cyclists and pedestrians happily thronged. I pointed out that successful cycling systems do not mix cyclists with buses in the same space, that Camden, on past form, would be unlikely to be able to prevent black cabs from using the route, and that the result would probably be very like the environmental sink of Oxford Street, one of the most polluted streets in the world. These things grind excruciatingly slowly, and three years on, still nothing has happened, but there is a new, supposedly more definitive plan for these streets being put out by Camden, with a consultation, under the title "West End Project", which you can read all about (or all about to the not very high level of detail that has been provided) here. On this page you may see the new dishonest artists' impression of the future Tottenham Court Road. 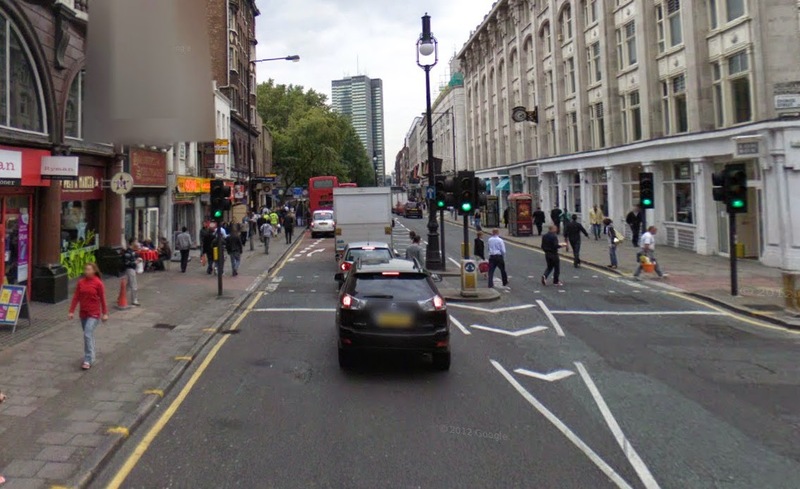 Local access for cars, taxis and loading would be allowed on short sections of Tottenham Court Road via side roads. The other main part of this plan is the design for Gower Street and Bloomsbury Street, which are proposed to go two-way for all traffic. This is where, under the current concept, cyclists get some semi-protected space. This will be in the form of one-way cycle lanes on both sides of the street protected by rubber armadillos, similar to those used in Royal College Street. Differences with that street design will be, however, the lack of planters (which have not proved too successful), and the lack of parking. In Royal College Street, parking outside the armadillos protects sections of cycle track from moving motor vehicles. It seems to me that in the Gower Street design, the cycle lanes protected only by armadillos will be highly vulnerable, in a very pressurised traffic space, far more so than Royal College Street, to getting driven and stopped upon by taxis and loading vehicles. Unfortunately, the details for the design of Gower Street as given on Camden's site are very poor. There is this image, not produced at any proper resolution, for the northern section, and a similar one for the southern, which contain no dimensions, and in no way explain how the cycle routes northbound and southbound are meant to work. There are, incomprehensibly, loading bays shown within the armadilloed cycle lanes at two points. There are lots of advanced stop areas, features which have nothing to do with Dutch or Danish cycle design for highly-trafficked roads, and which smack of a "dual network" concept (not all cyclists using the cycle facilities, in other words, because the are not good enough). My understanding is that the "protected" cycle lanes will be 1.5m wide. This is just about wide enough for overtaking in, but not generous, for a main cycle route. I am therefore slightly confused as to what the route concept really is here. I am not sure there is a coherent concept at all. The street that offers the most obvious north-south high-capacity cycle route option through the area remains Tottenham Court Road, as I said in 2011. It connects with Hampstead Road, to the north, and Charing Cross Road, to the south. Though Gower Street offers a route southwards towards Covent Garden and Waterloo Bridge (a currently highly unpleasant route, not all of the problems of which, by any means, would be solved by these plans), the north end of it is not accessible, except via the intimidating racetrack lane system on Euston Road, which is not proposed to be changed. Furthermore, there will be no northbound route on this alignment north of Grafton Way. These look like a pretty fatal flaws in the plans to me. The most detailed graphic (not very) from Camden's site shows that the protected lanes on Gower Street go no further north than Grafton Way, that there's no further route north on this alighnment, and that access from the north is only from Euston Road via unpleasant high-speed slip lanes. These are really bad flaws in the route design. As a gyratory-removal scheme, too, note that it is only partial. The northernmost part of Gower Street remains only southbound for motor vehicles, for the same reason as for cyclists: there are no changes to the Euston Road system (suggesting there is no collaboration between Camden and Transport for London, who control Euston Road). 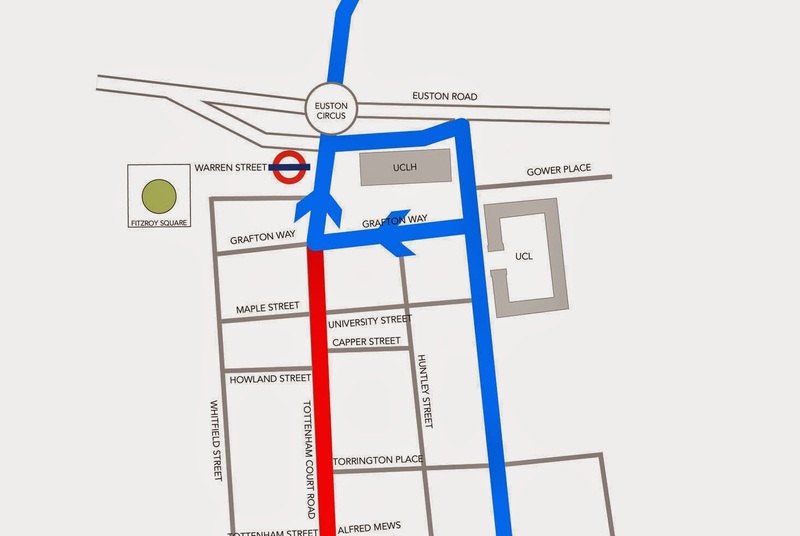 So, instead, the Camden plan creates a mini-gyratory system at the north end, via Grafton Way, which I submit is an inappropriate, small side road to take this main flow of traffic. Gyratory removal? Actually, a mini-gyratory where one does not exist now is created in the Camden plans on Grafton Way, an inappropriate street. 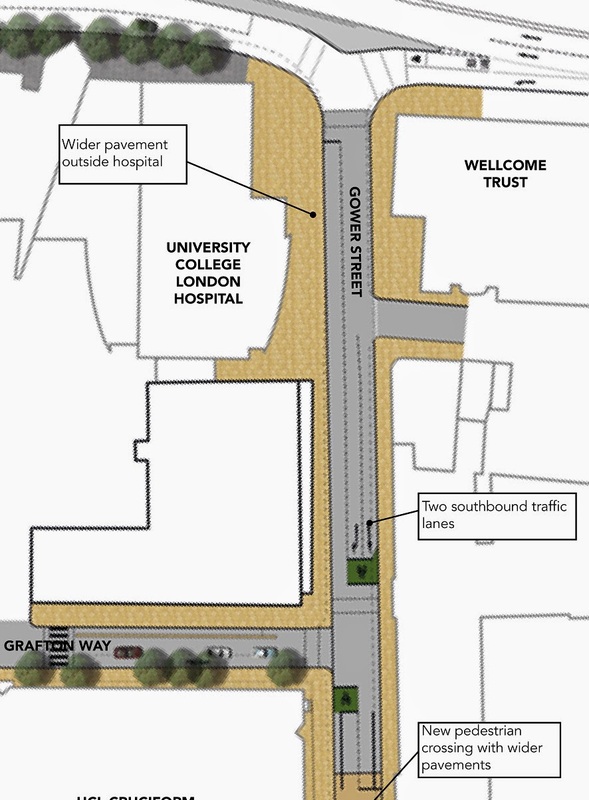 It seems that the concept is that cyclists will only use parts of the Gower Street corridor, connecting with it via the side streets, which are promised to have permeability improvements (i.e. more of them will be two-way for bikes) according to Camden Cyclists. On the other hand, on the obvious, continuous and straight north-south route, Tottenham Court Road, for most hours of the week, cyclists will be mixing with general two-way traffic, so the situation is likely to resemble how Piccadilly is now. At the better times of the week cyclists will only be mixing with heavy flows of buses, and cars and lorries on certain stretches. And I'm assuming perfect enforcement of the complicated and part-time restrictions. Does all this sound like a very cycle-friendly plan? I think not. I hear, incidentally, that the Mayor's Cycling Commissioner, Andrew Gilligan is none too impressed with the scheme either, and is refusing to contribute to the costs from his budget, though he cannot stop Camden doing what it wants on its own roads. I think Camden Council has got obsessed by this idea of "gyratory removal" and is not thinking radically enough about how the whole area could be optimised for buses, cyclists, pedestrians, and, indeed, businesses. I think a far better result could be got for cycling, and no worse for buses and pedestrians, probably better, by retaining the one-way system, but reducing the capacity of it by having only one general traffic lane lane northbound in Tottenham Court Road and one southbound in Gower Street. I would put a dedicated bus lane all the way down Gower Street and a full kerb-segregated cycle track there as well. These would be southbound only. 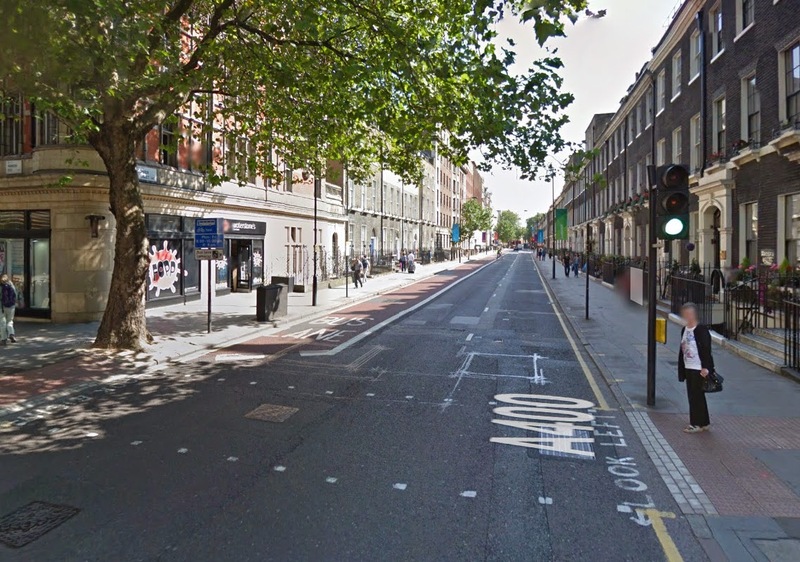 In Tottenham Court Road I would put one-way kerb-segregated cycle tracks in both directions. In the northern, wide section of Tottenham Court Road I would put a dedicated northbound bus lane, expanding out from the single motor traffic lane in the narrower southern part, and I would have it separated by bus boarding islands from the northbound cycle track at the stops. There would be loading areas for lorries in appropriate places outside the cycle tracks. My scheme would seriously reduce general motor capacity, and I think this is a good thing. It is what is needed. The trouble with the Camden scheme is that it is more or less capacity neutral. It is another Piccadilly and Haymarket: it is not really prioritising cycling, it is just shifting the deckchairs around a little, pushing flows in certain directions from one street to another. My scheme would instead seriously reallocate road space and seriously protect cyclists, while allowing the other essential functions in the street to continue, and it would do this by retaining the one-way system, making it more like a Dutch city-centre one-way system. The environmental benefits to everybody, cyclist or not, would be enormous. Gower Street now. I would reallocate these lanes by making the left one a wide cycle track with kerb segregation, making the middle one the bus lane, and keeping the outer lane as it is. All would be southbound. This fits with the traffic system at the northern end as currently configured, which only facilitates the southbound route. Tottenham Court Road, north of Goodge street, now. I would reallocate this space by getting rid of the rubbish in the middle of the road and creating wide, kerb-secgregasted cycle tracks running in both directions, plus a bus lane and a separate general traffic lane running northbound. Bus stops would be on islands. Tottenham Court Road, south end, now. I would reallocate this space to wide, kerb-segregated cycle tracks running in both directions, with one northbound lane for all other traffic. Taxis could still have their waiting area, outside the contraflow cycle track, and there would be spaces for loading for shops outside the track. The benefits of my plan would not only be motor traffic reduction: it is also simpler. The current motor flows are not altered and there is no need for any large junction changes. There is no small gyratory system inappropriately routed via Grafton Way. The current cycle route towards Covent Garden and Waterloo Bridge is maintained and made far better. The Charing Cross Road to Camden Town route via Tottenham Court Road is made safe and pleasant for cycling, and the exact direct reverse route becomes possible, and just as easy and pleasant. This scheme would really open the West End up for cycling and give us a taste of a proper transfer of Dutch principles to central London. Importantly, it would be the same all the time: no time-dependence, no uncertain enforcement. It would be self-enforcing all the time. Here is the biggest problem with Camden's proposals: for most hours of the week, between 7pm and 7am, and all day on Sunday, they are making Tottenham Court Road a free-for all, no bus lanes, no prioritisation at all, opening it up to all traffic, in both directions, as it is not open now. This is an utterly retrograde step. This is the aspect of the plan that neither Camden's consultation, nor the commentary from Camden Cyclists, nor that from Cyclists in the City dwells on. So I draw attention to it, and I invite you to think about it. This is going to be a massive opening up of the West End to new motor traffic movements, making many car journeys in the evenings, at night, and on Sundays, in central London easier and more convenient. This is the exact reverse of what Camden should be doing. I said I would mention an example of a gyratory which I think should be removed. So I'll briefly describe another Camden scheme, where it looks like they might actually be getting it right. This is at an early stage, and there is no consultation yet I can point you to, and no clear official plans yet, but I have seen proposals for the removal of the Swiss Cottage gyratory, and these look like a thoroughly good thing – subject to details, not yet present, being got right. This is connected with Cycle Superhighway 11, which on current plans will run round the Outer Circle, up Avenue road, and into Finchley road via Swiss Cottage. The gyratory removal plan is a crucial part of this, and it has support from Andrew Gilligan. One option that I have seen sketched out by Camden involves making the main general traffic route up the A41, Finchley Road, continuous, with a signalised junction with the west end of Adelaide Road (to the south of the Odeon Cinema on the current gyratory island). The part of Avenue Road outside the library, the current east side of the gyratory, would be taken out of the traffic system, and only used for buses and bikes, which would have a direct signalised route through to the part of Avenue Road south of Adelaide Roads, and to Finchley Road, to the north. The connection of the A41 with Fitzjohn's Avenue (B511) would be closed off, thereby cutting traffic through into the leafy residential streets of Hampstead on this axis off in one stroke. Cycle Superhighway 11 would run in some sort of segregated or semi-segregated format up Avenue Road, and would cross into the bus-bike section by the library with signals. There would be ample space here to segregate it from bus traffic and to put the bus stops on islands. It would go on northwards into Finchley Road via more signals. The critical advantage of making the main A41 route continuous on Finchley Road is that we would loose the circulating system that pushes so much traffic from the north down into Avenue Road (B525) and through to Regent's Park. The design of the gyratory at the moment encourages this totally inappropriate flow. Traffic from the A41 semi-motorway from the outer suburbs just goes bombing into this narrow, leafy road, with its big new schools on the left hand side, and ends up at the Outer Circle. 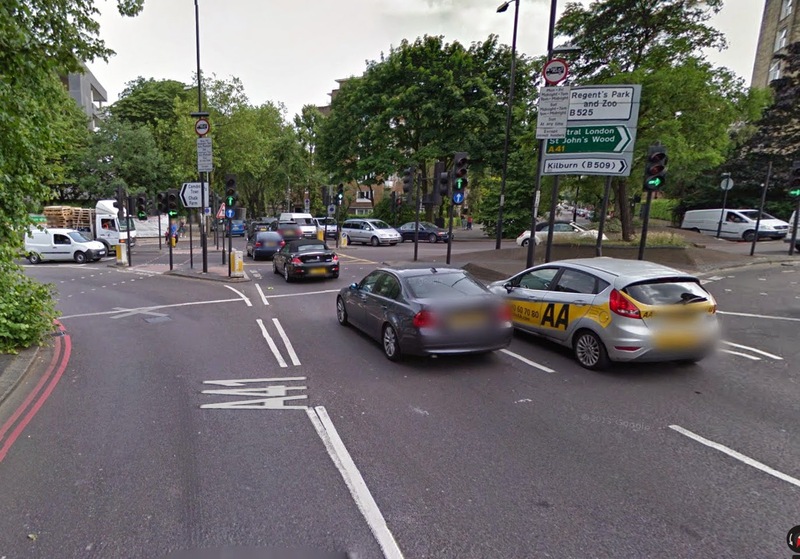 Though there will still be a connection between the northern A41 and Avenue Road, in the new plan, it will involve a left signalised turn at the Adelaide Road / Finchley Road /Hilgrove Road (B509) junction, and then a right signalised turn at the Avenue Road junction. 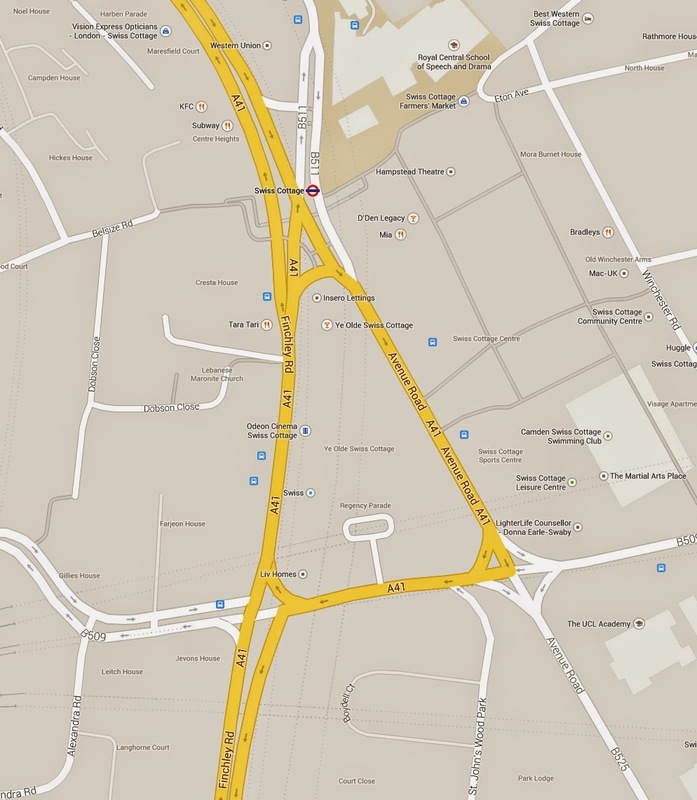 It will no longer be an obvious route, the obvious route will become the A41 Finchley Road down towards Baker Street. The traffic in Avenue Road should be massively reduced, and there will be space for a decent Cycle Superhighway there. This is the pint at which narrow, residential Avenue Road becomes, inappropriately, the obvious route for traffic heading from the north towards central London. The abolition of the gyratory would end this situation. As I say, these are early days on this scheme, and I wouldn't get my hopes up too far that it will be as good as this. People have been talking about removal of the Swiss Cottage Gyratory for decades, and nothing has happened. But hopefully we will be able to get agreement between TfL, the Cycling Commissioner, and Camden, on a scheme along these lines that I have described, and, if we do, it will be a thoroughly good thing that the widely-hated Swiss Cottage Gyratory goes. So, with gyratories, there are cases and other cases, as I said at the beginning, to be judged on their exact details. I the meantime, what can be done bout Camden's poor "West End Project" plan? There is a consultation, which can be filled in here. In addition, Camden Cyclists are organising a public meeting, at the YMCA, Indian Student Hostel, 41 Fitzroy Square W1T 6AQ at 7pm on Monday 30 June. Camden councillors officers will be present to explain their scheme and take questions. I suggest people attend this and make their views known there as well. Register for the meeting here. We have concluded that we will support the Camden proposal unless some much better alternative comes up. However, we feel that it will not do much to encourage new people to cycle, although the increase of permeability will allow those that want to to escape via the side streets. But being able to escape isn't really the main function of a cycling street, particularly one that is likely to be part of the new Central London Cycle Grid. I would much rather see this scheme happen than see nothing happen, as is the case in other parts of London. Space4Cycling should be better than this. But this is better than what's there and better than nothing. It's all a bit of a damp squib, really. I say, this is all rather weak. It's not difficult to come up with a better, more radical plan, and I've done so. The critical step is letting go of the idea "evil gyratory system must go". My plan, to reiterate, is to keep the general traffic system as it is now, but to make a radical reduction in general motor capcity through having only one general northbound lane on Tottenham Court Road, and one general lane southbound on Gower Street and Bloomsbury Street. There would be a dedicated southbound bus lane in Gower Street and Bloomsbury Street, and a dedicated northbound bus lane in the wider, northern part of Tottenham Court Road. 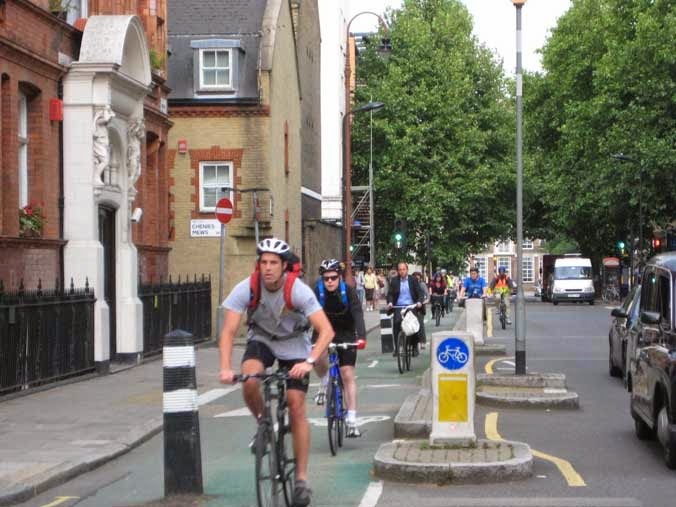 There would be segregated cycle tracks, southbound only on Gower Street and Bloomsbury Street, and in both directions on Tottenham Court Road. There would be island bus stops so buses would never cross the paths of cyclists. The whole system would be full-time. You can call this the Voleospeed West End Plan if you like. You can refer to it in the consultation and at the meeting, and direct Camden Council and others here. I suggest we lobby for this Voleospeed West End Plan. What have we got to lose? As I think Schrödinger's Cat recently asked, rhetorically, are we afraid that what crumbs there are for cycling in the current plans will be removed from the table if we object, and that we will get something even worse? I hardly think that's likely. What is likely is that Camden will do what they have already decided to do anyway, or they will make some minor modifications to their plan. But if everybody makes enough of a noise, with pressure from Andew Gilligan and parts of TfL as well, perhaps they can be forced to go back to the drawing board. I certainly don't believe we will be sitting here in a few years' time, thinking "If only we had not objected to that West End Project as proposed by Camden and not proposed our own silly, impractical, too-ambitious plan to make London WC1 really look like Amsterdam, then we would not have got this horrible thing that doesn't even have the half-hearted cycle facilities that Camden was offering us then". In my two decades of cycle campaigning experience, I can't recall a case that has ever unfolded like that. We have never regretted scuppering a half-hearted plan because we asked for something better. Either we suggest the best and lobby for the best, and get something a bit worse, or we moan a bit, let the planners do their own thing, and we get the crumbs that they offer. Let's have a bit of courage about this. Keep the Tottenham Court Road gyratory gyrating for motor vehicles, and civilise it for cyclists and everyone else. I agree. Except put the cycle track on the right hand side of the road to avoid having island bus stops. For Gower Street, you recommend retaining the one-way system, with only one general traffic lane lane southbound and a dedicated bus lane and a full kerb-segregated southbound cycle track. This would require at least 3m + 3m + 2.7m = 8.7m, which will fit. But please tell us what you propose for bus stops. Maybe the Royal College Street "table on the track" bus stop treatment would be OK here, I've never seen great numbers of people at these bus stops. I would have thought a narrow boarder could be squeezed in, after all, there is room for an island here. On the other hand, Linus's proposal above seems a good one, that I hadn't considered: put the cycle track on the right hand side. You suggest: only one general northbound lane and segregated cycle tracks, in both directions. In the northern, wide section a dedicated northbound bus lane, expanding out from the single motor traffic lane in the narrower southern part, and I would have it separated by bus boarding islands from the northbound cycle track at the stops. You would need: = seg cycle lane + general traffic + seg cycle lane = 2.7 + 3 + 2.7 = 8.4 OK for narrow part. But how will the bus stops work? The figures and plans I have (which I expect you also have, Jean – if not, I can forward them) give the narrowest part of TCR as being "Point 2" just south of Great Russell Street, with a carriageway width 9.8m, western pavement 3m, eastern pavement 4.1m. So even without taking anything from the pavements (which could be done) you've got 1.4m spare on your calculated total of 8.4m that you can can add to the normal width of the segregation island, which I take to be 0.7m, giving a 2.3m wide bus boarder. In practice if you wanted more you could shave a bit off a pavement or go down to 1.5m width for a cycle track for a little way. I'm absolutely sure all this can be fitted in. I agree with Rachel Aldred that the the smallest width of TCR should not constrain possible options. Flexibility can and should be used along the length of this rather irregular road. If you look at the layout now, it is indeed highly inconsistent, or "flexible" one might say. It could be rebuilt flexibly, but with continuous protected space for cycling. Yes, it takes some designing. There are people who are paid to do that, once they are told by politicians what is wanted. Random thought for narrowest point. Could you maintain dedicated dual direction cycling but have a 'single track' light controlled section for buses and deal with it the way trains deal with single sections of track - alternating, signal controlled traffic. The increased footfall from Crossrail,and Camden's hopes of revitalising TCR as a destination shopping street make the plans to restrict taxis from using TCR seem hopelessly naive. Cabs will already be able to use the 'local access' exemption if they're stopped, but frankly, I can't see how Camden would ever be able to enforce this. It seems entirely likely that cabs will routinely ignore the restriction in order to pick up passengers from the stations, hotels and shops on the street, and this makes it even more likely that the LTDA will campaign to have the restriction lifted in a few years, as it's neither enforceable nor good for business. So exactly how much traffic will be kept off TCR, in practice? I agree. It's too complicated. I can't imagine how it's going to be enforceable. That's one good reason this plan needs a rethink. Keeping the taxis off is a long shot, but it's well worth a try. Crossrail will greatly increase ped traffic, and also increase transfers to buses - something has to give. It should be used as an occasion to push for an overall reduction in motor vehicle traffic. Further to my original comment, I contacted LB Camden to enquire about how they plan to keep non-bus traffic off TCR. They're planning signage (although they haven't specified where), with an initial grace period while the changes bed in, followed by the possibility of enforcement in the future. I think it's safe to say that in practice, it will be completely unenforceable, and I would be very surprised if taxi drivers didn't figure this out very quickly. Their livelihood depends on being able to pick up passengers from stations and deliver them to hotels and shops; is it really realistic to expect that without hard measures (like a bus gate) they're going to comply with the restrictions?